Wright State University, at the beginning of its fifty second year, is in a crisis that will inevitably shape its next fifty two years in Dayton, Ohio. We are 15,000 students that are being immediately impacted by the strike. But the impacts of this strike will undoubtedly effect generations of students who look to attend Wright State in the future. In 1990, there was a 29 day strike at Temple University that resulted in 3,500 students dis-enrolling. As a result, 260 classes were cut. Students like myself have already received emails from our deans and chairs regarding classes that have not been covered. The fact that late registration fees have been waived indicates that Wright State is facing a similar challenge. The administration is preemptively positioning itself to announce the canceling of classes because they aren’t covered. Substitutes have not been found to teach specific classes that we come here to learn from experts in their field. Unfortunately, as I write this I know it will be used to strengthen the bargaining position of the AAUP negotiating team. If classes are cut, we will see a mass exodus of students enrolled in programs that will be affected. The hardest hit programs are primarily liberal arts programs; which require the instructor to have very specific bases of knowledge combined with years of historical understanding and experience. One of the most valuable instructors of Chinese Foreign Policy are those like Dr. Luehrmann. Who published her first scholarly article on the topic before many of her students were even born. If these classes are cut, even for one semester, it will take years to rebuild the consumer base of these programs. At Temple University, it took nine years to recover from the loss of enrollment to pre-strike levels. It’s a very clear series of events. 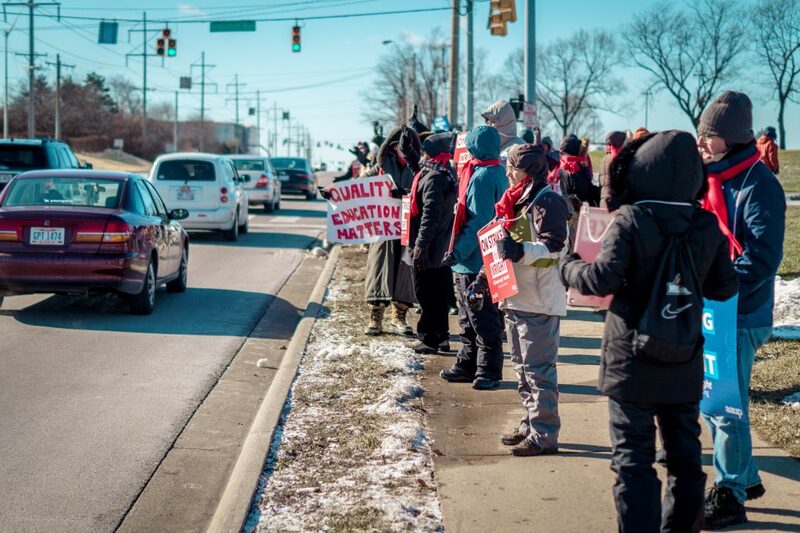 First, a prolonged strike leads to specific and specialized classes and programs being cut. This causes students who chose WSU for these programs to dis-enroll from the university. The lack of a consumer base for these programs in subsequent semesters forces the university to stop offering these classes and programs and for the professors who once taught them to become unnecessary on payroll. The cliff that Wright State finds itself on should not be used as a bargaining platform. Members of the AAUP need to realize that if they push the Administration off of that cliff, they will fall with them. The goal of negotiations should be finding a solution that is not detrimental to either the faculty or the University as a whole, and in that regard, progress is being made. Over the past week, negotiations occurred between the two sides. The Dayton Daily News reported that the central issue left on the table is health care. This indicated to me that other issues that concerned the AAUP, namely workload and furloughs, have been tentatively resolved. So yes, from an outside perspective, it looks like progress is being made. When it comes to health care, the two sides seem to be at an impasse. Prior to the imposition of terms and conditions on January 4, the AAUP enjoyed a 90-10 health care plan. 90-10 is in reference to the split of healthcare costs between the provider and the customer. This is a very rare plan, as it is so expensive for the provider to maintain. It is almost unheard of in the private sector and is an above average plan for the 13 other public universities across the state of Ohio. As stated before, a 90-10 plan is very expensive. From a University analysis, the 90-10 plan increases the cost of healthcare for WSU 13-16 percent annually. Using the rule of 72, it is simple to calculate that this would double the cost of health care for the university in under 5 years. This plan is simply unsustainable. The Union contends that by agreeing to the universal healthcare plan that all other employees of Wright State use, that they are giving up their right to bargain on healthcare. Furthermore, they fear that the Administration will just adjust the plan and give everyone an even worse plan than the 80-20 plan (which is still a very good healthcare plan) that they already fall under. This fear is short sighted because they are making an assumption that the administration would be willing to cut their own healthcare just to spite the AAUP members. In an email sent from Dr. Sean Wilson (a political science professor) to the Faculty listserv. Which was later distributed to the media. “On Monday night the University did what we asked: they negotiated with us one last time. And they gave us [the union] many concessions. So many, in fact, that the union team agreed to everything except for one issue:health care,” Wilson stated. I ask members of the AAUP, my favorite professors, to take into account the potential consequences of allowing a strike to continue to a point where classes are cut. I ask them to recall the effects of a prolonged strike at Temple University and to imagine the detrimental effects that similar results would have on not only Wright State University, but also the students it serves. Students that came here to receive an affordable education that will serve as a launchpad into the rest of our lives. I am glad to hear that the divide between the Administration and the AAUP has closed during their negotiation sessions on Sunday and Monday. I sincerely hope that the Administration does not back down from the concessions they agreed to. I hope that the members of the AAUP will recognize the situation that the university is in, take the concessions they’ve fought so hard for, but then also meet the Administration in the middle and accept the healthcare plan as every other employee of Wright State. We students want our teachers back. We want the programs that we are enrolled in to continue uninterrupted. As a concerned student, one who cares deeply for my professors, and my classmates, I am not anti-faculty, I am not anti-administration, I am anti-strike. The views and opinions expressed in this article are those of the author and do not reflect the official position of Wright State Student Government Association.